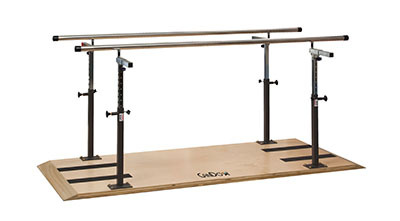 The CanDo® Platform Mounted Parallel Bars feature adjustable parallel bars mounted to 1-1/2" thick hardwood plywood base with a ultra-durable, UV-cured satin finish. The stainless-steel handrails can easily change in height with spring-loaded plungers and numbered height indicator strips. There is safety tread at both ends of the platform as well as end bumpers on the handrails for added safety. Under normal physical therapy use, this platform can hold up to 400 pounds. 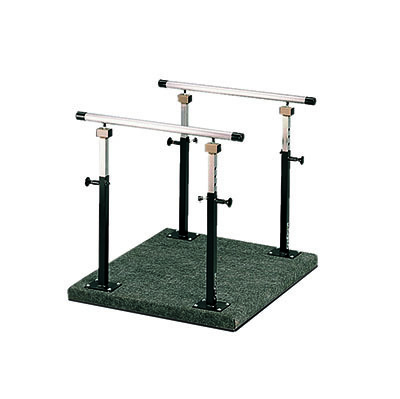 Dimensions: 84" x 26" x 18"
Dimensions: 120" x 26" x 18"
Dimensions: 144" x 26" x 18"
The CanDo® Adjustable Balance Platform feature adjustable platform mounted handrails on a rugged indoor/outdoor carpet. 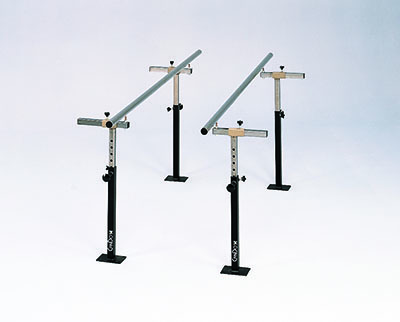 The stainless-steel handrails can easily change in height with spring-loaded plungers. End bumpers are found on the handrails for added safety. 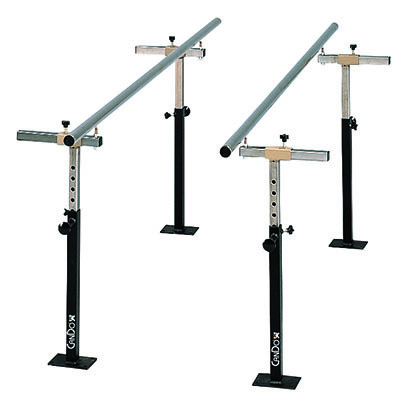 Dimensions: 36" x 26" x 36"
The CanDo® Floor Mounted Parallel Bars feature parallel bars and uprights that mount directly to the floor. The stainless-steel handrails can easily change in height with spring-loaded plungers and numbered height indicator strips. End bumpers are found on the handrails for added safety. Under normal physical therapy use, this platform can hold up to 400 pounds. Dimensions: 84" x 9" x 10"
Dimensions: 120" x 26" x 10"
Dimensions: 144" x 26" x 10"